This comprehensive optical pack will allow you to implement the main methods for studying geometrical optics. The LEMARDELEY Spectrogoniometer is used to study prisms and diffraction gratings. This experiment will let you view light at the surface of a diopter. This optical pack is designed to highlight the diffraction phenomenon by a number of components : slits, lines and holes. forms an air wedge with a curvilinear boundary surface. The Michelson interferometer is an optical device producing interferences by amplitude division. The Mach-Zender interferometer consists of two semi-reflecting plates (beamsplitters) and wo mirrors. A light beam is divided into two, after which both beams are recombined by eans of a semi-reflecting mirror. The Fabry-Perot interferometer consists of two parallel semi-reflecting plates (beamsplitters), separated by a distance L (The plate reflection coefficient is greater than 90%). 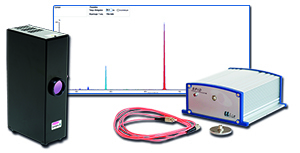 The SPID spectrometer is designed to study simple components belonging to the light spectrum of various light sources. It is also used to study filters, solid or not, in transmission or absorption. An absorption model allows you to implement with ease Beer Lambert’s law and to observe chemical kinetic curves. The didactic digital camera model is an excellent tool for understanding how a camera works.